If you have been a subscriber to the RentalPreneurs newsletter or a member of the RentalPreneurs Club, you may not have heard from me in the last 2 months. Please accept my apologies, as I understand that you had been expecting from me new vacation rental marketing tips, interviews with short-term rental industry experts and more deep-dives on the tools that I use to handle my rental businesses. But this quiet period was actually quite busy on my side and could also be beneficial to you. It let me start gaining a new perspective on the short-term rental industry that I will start sharing with you from today on. So, what has happened to me and what can you get out it? But why on earth have I joined Booking.com’s Homes & Apartments division? Since mid-May 2016, I’ve joined one the most global ambitious players in the short-term rental industry: Booking.com. To U.S. readers, the name may still be a bit unfamiliar, but Booking.com is the world’s number 1 website for booking accommodations online. Really. It is incredibly powerful in Europe, being number 1 in most markets, and is growing in Russia, China and the US. Booking.com is owned by US travel company Priceline, but Booking.com is so big that it represents a majority of the Priceline Group’s revenues. Well, I can completely understand these opinions, as it was exactly what I thought until March of this year. I had listed one of my St Barths vacation rentals, BelAmour, on Booking.com in May 2015 but chose to close my listing less than 2 months later. I had found the whole listing process lengthy compared with competing sites. The website interface was perfect for hotel managers, but really bad for vacation rental owner: It looked too complicated, the terms used were clearly for hotels, the availability calendar made sense for a property with dozens of similar bedrooms but not for a 1-bedroom vacation rental house. But the biggest deal-breaker for me had been the way Booking.com handled instant bookings at the time. Let’s just say that the risk of getting double-bookings, no-shows and last-minute cancellations seemed just too high. So, what made me want to join Booking.com, to move to their global headquarters in Amsterdam and to start working on growing their short-term rental business? (And what can the readers of the RentalPreneurs blog get from this move?). 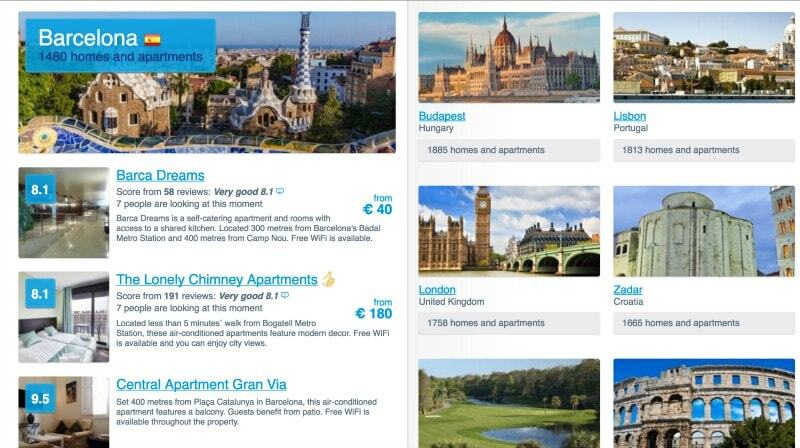 Booking.com is already listing more than 450,000 short-term rental properties, from villas in Florida to chalets in Switzerland, and from apartments in Berlin to gites in France. Did you know that? I did not! Note that the definition of a property is wide, as a building with several apartments can count as a property. I am not allowed to give you here the exact number, but let’s just say that the actual number of individual units that are listed on Booking.com is not in the thousands, but in the millions. Yet, people, especially in the US, talk about Airbnb and HomeAway all the time, while Booking.com is silently growing as a force. In March 2016, I met in Barcelona a very nice Italian guy called Gianbattista Vespucci. He was heading the commercial side of the Booking.com Homes & Apartments division. I was there to give a speech about Facebook remarketing at the yearly European VRMA conference. I chatted 1.5 hour with him and I was taken aback by how much candid he was about what Booking.com had to improve. No arrogance here, just pure willingness to deliver more to property owners and managers. He clearly outline what I could bring to his team and it sounded both challenging and attractive. As I went through the interview process with Booking.com, I interviewed with about 8 people. I was very impresses by how nice, matter-of-fact and driven they all seemed. In 2015, the Booking.com management realized that they needed to drastically change the way they were handling short-term rentals. So, they decided to set up the Homes & Apartments division as a sort of start-up venture inside the company: We have our own developer, commercial and marketing teams, for instance. As an entrepreneur who had mostly worked in small structures, this sounded quite attractive: Being able to build something global, relying on Booking.com’s proven expertise, yet being given carte blanche to innovate on several fronts. When I negotiated my joining Booking.com, it was clear that I could not pursue my consulting gigs. I had to avoid conflicts of interest between my clients and my new employer. Yet, I was happy to learn that I could keep my vacation rentals business going and even keep on blogging on RentalPreneurs. So, I am now working in Amsterdam. Along with the rest of the Commercial team, my job is to represent the voice of property owners and property managers, big and small. That is, I represent your voice. Hearing from you and keeping on sharing with you what I see in the industry is a positive thing for you, for Booking.com and for me, as it is helping each of us do a better job at growing our respective short-term rental businesses. So I’ve said Yeah! to Booking.com and I hope that I will be able to get you to say “Booking.yeah” as well very soon! N.B. : The Booking.com vacation rental division has started created education videos for property owners and managers. For instance, the following one about getting better reviews from guests. Let me know what you think!